If you weren’t part of North Carolina’s very impressive early voter turnout, we hope you’re voting today. If you’re waiting in one of the many long lines at polling places today, it’s worth it. 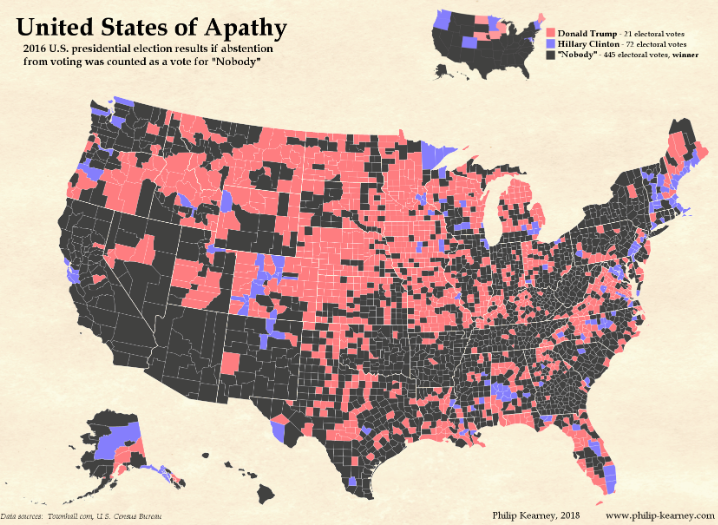 And if you need to be reminded why, take out your smartphone and check out the “United States of Apathy” interactive map. The map, originally created by cartographer Philip Kearney, uses 2016 voter data to illustrate which counties had more eligible voters who did not cast a ballot than those who voted for the winning candidate in that county. “Nobody” won more counties, more states, and more electoral votes than either candidate for president. Esri geographer Jim Herries invited Kearney to co-author an interactive version of this map so that they could build a complementary story map to explore the relationship between voter apathy and election outcomes. According to a recent study from the Pew Research Center, the United States ranks 26th out of 32 highly developed democracies, with just over half of the eligible voting population participating in national elections. Another Pew Research study asked Americans why they did not vote in 2016. 25% cited dissatisfaction with the candidates and another 15% cited lack of interest and the feeling that their vote wouldn’t matter. After you’ve discovered all the ins-and-outs of the map and become sufficiently disgusted with American voter apathy, it’s worth reading this piece by Jamelle Bouie in Slate examining the various reasons young voters historically have the lowest turnout. More striking than the low averages is the consistency of the difference with older Americans. In any given election year, the youngest voters always turn out at lower rates than their next oldest counterparts, who always turn out at lower rates than their next oldest counterparts, and so on, until you reach the oldest Americans. Since 1972, older Americans have voted at an average rate of 67 percent in presidential elections and nearly 59 percent in midterms. The fact of this pattern should obliterate any speculation about generational difference. There’s either something about being young that precludes or prevents political participation, or there’s something about the structure of American elections that impedes young people from participating. It’s much more likely that something is the instability that comes with being young. You’re less likely to have a permanent address, less likely to have secure and flexible employment, less likely to have the confidence to participate in the political process. You can see all of this in a set of interviews with young adults who say they won’t vote in this week’s elections, published in New York magazine. Some respondents are cynical or simply uninspired. But others report real obstacles to their ability to participate. In Buncombe County we elected the first Africa American man(Miller:sheriff) ever in significant and powerful position. However, due to the gerrymandering of the 10th and 11th district, no Democrat stands a chance. Big Blue Asheville, Buncombe County, with its youthful demographics, will always be undone by Deep Red Hendersonville which is an aging White population in Henderson county. If u we’re young and grasped this, why would you vote?